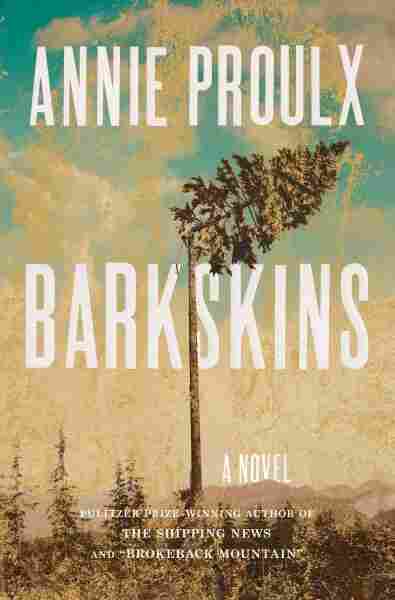 Book Review: 'Barkskins: A Novel' By Annie Proulx Annie Proulx's epic new novel is a multigenerational, multicentury epic about the fall of forests before human depredation — just don't think about how many trees went into its 700-plus pages. Two men arrive in a world of infinite forest: "Mud, rain, biting insects and the odor of willows made the first impression of New France. The second was of dark vast forest, inimical wilderness." René Sel and Charles Duquet are indentured French woodsmen, set to work chipping away at the forests of Canada — then called New France. Annie Proulx's new novel, which spans more than 300 years and 700 pages, is a multigenerational epic following the descendents of these two men. Duquet founds a logging empire; Sel marries a Mi'kmaw woman. By giving the two dynasties the same starting point — small men among big trees — Proulx demonstrates the long-flowering fruits of character (Duquet is merciless and ambitious; Sel is quiet and stable), but also the ways that heritage is destiny. Sel's Mi'kmaw descendants suffer the draining and repressive power of racism, while Duquet's flourish. "How big is this forest?" Sel asks when he arrives. "It is the forest of the world," says their new master. "It is infinite. It twists around as a snake swallows its own tail and has no end and no beginning. No one has ever seen its farthest dimension." It seemed, in those early days, that "countless ax blows were nothing against the endless extent of the earth's spiky forest crown." But three centuries later, we have come up against the end of those once-limitless forests. Barkskins is their funeral song. As Sel chopped, "the wildness of the world receded, the vast invisible web of filaments that connected human life to animals, trees to flesh and bones to grass shivered as each tree fell and one by one the web strands snapped." Although Barkskins is full of strange and vibrant humanity, that "vast invisible web" is its central character. The woods are alive: rivers are "snarling," shrill mosquitoes "keening," hills "exhaling" mist, trees "pulsing" with pollen. The fish are so plentiful that rivers look "made of hard muscle." The long and slow sickness — humanity — that ravages this gasping, living place is the book's theme. The humans that pass over the earth flame brightly and then disappear. A book with this many people flitting through it could be hard to keep track of, but Proulx sketches each person with vigorous, unforgettable strokes. One minor character "seemed to have started life as an ash tree, barked, scraped, and whittled down to sinewy fiber," another is a "cadaverous man with eyes like candles in a cave," and a third has a head that "looked as though it had been lopped off with a broadax just above the eyebrows and then squeezed back together leaving a great horizontal scar." The only gnats in this lush and lovely jungle of a book come in the dialogue, which shows the awkwardness of mimicking 300 years of language evolution with complicating factors of dialects, accents and broken speech. A book with this many people flitting through it could be hard to keep track of, but Proulx sketches each person with vigorous, unforgettable strokes. In Homer's famous simile, the lives of men are like the generations of leaves: "Now the wind scatters the old leaves across the earth, now the living timber bursts with the new buds and spring comes round again." But in a story about the end of forests, it is not good to be a leaf. Humans are victims of the merciless march of events, of fires, accidents, murders, illnesses; even for the strongest characters, self-determination is a temporary luxury. "Were not Rene Sel's children and grandchildren, as he had been, like leaves that fall on moving water, to be carried where the stream takes them?" In The Great Gatsby, F. Scott Fitzgerald imagined a European sailor sighting the green and monumental shores of the New World as coming "face to face for the last time in history with something commensurate to his capacity for wonder." It is that wonder at monumental nature, and simultaneous grief at its diminishment, that animates Barkskins. So, read it, absorb its urgent message — and try not to think about all the trees that probably went into those 713 pages.